Nearly all modern smartphones are fragile and there's no doubt about it. Changes are that regardless of its make and model, a single drop onto anything harder than hardwood floor will result in permanent damage to one's beloved device. 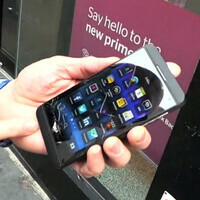 The BlackBerry Z10 is no exception, as it becomes evident from this recently conducted drop test. Well, the BlackBerry Z10 actually did pretty good during the first two phases of the test. In fact, drops onto carpet and hardwood floor didn't damage its body at all. That's likely because the handset's exterior is made out of plastic, which is much more flexible than metal, for example, so it absorbs some of the impact's energy. But eventually, the display on the BlackBerry Z10 cracked, which rendered the smartphone pretty useless. Still, in case you're planning on ever owning the BlackBerry Z10, you can now rest assured that it is about as durable as any other contemporary smartphone. Of course, outfitting it with a case might be a good idea. This is the stage where none can compete with Nokia.. I woouldnt say that. There are manufactures that made rugged phones specifically to handle drops and being in water. The Casio G Zone Commando, I think Moto did one too. yes, but right here we're talking about premium class smartphones, not phones that are made to be rugged and withstand all kinds of nasty conditions like the GZone e.g. i disagree with you! nokia phones are really tough built and its not even certified to be shock proof or whatever rugged specific that you want on it! Well they are one piece plastic. I guess one piece plastic is more rugged than glass, metals, and multi piece plastic. the Lumia 920 torture test makes this one puny. LOL so true! L920 is probably like "Nothing to see here. Moving on..."
I've had my doubts about the digitizer tech they've used on the Z10, and this doesn't help my doubts at all, but I'll have to test it myself to see how it feels. Even John V. said that the screen smudges really easily, which is one of my biggest pet peeves. I'm not sure why they didn't opt for better materials when it came to such an essential part of the phone. No Dragontail glass or Gorilla glass in this BB Z10? Epic fail! Put it in a Seidio case. I have done that with my 9800. Been dropped on concrete and still okay,going greatguns. hey blackberry you can do better than this... that was a fail drop !!! This type of test is hard to actually draw conclusions from: with any phone, a change in a few tenths of a degree when dropped, or a slight shift in rotation speed/angle can make the difference between a small cosmetic scratch or a cracked and unusable screen: some phones are very strong when dropped in a certain way and a slightly different way will see them shatter whilst another type would be almost unscathed. Nothing gonna beat the Tank Phone.. Lumia 920!! Am I the only one that can't get the video to work?